BUCCANEER MOTOR COMPANY was established in it’s current format in 1985 specialising in Mercedes, BMW and Porsche, but currently we are now providing all different types of vehicles at value for money prices from first cars for teenagers, through saloons, hatchbacks, MPV’s and estates up to prestige and performance cars. If there is nothing that interests you in our current listings, Please ring ask as new stock is always arriving or we may know of something suitable which can be obtained at the right price from one of our many colleagues and customers throughout the local trade. Our sister companies :- Express Motor Parts Ltd established in 1971 supplies Car Components, Spares, Accessories, Chemicals, Paints and Panels to the Motor Trade within a 25 mile radius. Express Equipment Centre supplies tools and equipment to a multitude of different businesses. Factories, workshops, public institutions and private individuals all over the south west of England and boasts huge stocks of Workshop Equipment on display in several showrooms. Autotech Garage Services established in 1999. 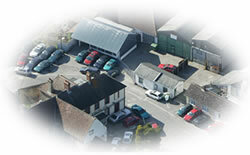 We took over as the local village garage when Crossroads garage closed and can offer Servicing and Repairs, Tyres, Batteries, Computer Diagnostics, Welding, Air Conditioning, MOT Preparation and Submission.